I Wonder: "Do you carry more or less makeup today?" Looking back, it amazes me how I bring less and less makeup since I became a professional make up artist. 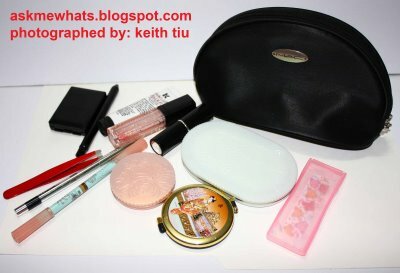 Looking at my Year 2008 post, I talked about what's inside my bag and make up bag! 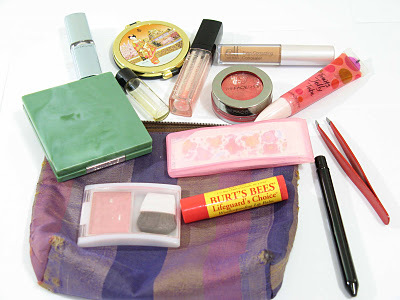 Today, I usually just carry a powder or powder foundation and a lipstick and lip balm. Usually I don't even bring a makeup pouch with me anymore! I don't know why if it's a makeup artist in me that tries not to lug as much makeup anymore since I've been doing that for makeup gigs and I want to put to rest, or could be, I am growing older so putting on a lot of makeup is not a thing for me anymore (not unless for special occasions). Now that I'm thinking about it, I think I knew the answer! I have probably learned so much from my own product reviewing that I get to use the right products and I can get away with less retouching for the day and the fact that most products that are available in the market are targeted on different skin types and I was able to use the one that's perfect for me! Less retouching = less lugging of makeup! "Do you carry more or less makeup Today?" I'd love to hear from you and let's solve this mystery! i guess time really changes a person, not just in kikay kit...lol! Yay! hahahah Considering we blog about beauty no? funny how things/times change! I do believe you! hahaha :) Your makeup's staying powder is quite good or you're not into wearing makeup lately? retouch is not in my vocabulary hahahahaha I only bring Carmex and a lipstick. That's still a lot of products for retouch! Haha... I usually just carry a lip balm and oil-blotting sheets. Wow, well I guess looking back, i was the same as you! I carry less and less, at times just lip balm!